Daniel M. Jones founded the Church of Jediism in 2007 following the Jedi census phenomenon of 2001. 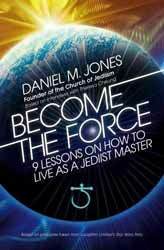 Today, the Church offers courses on Jediism from many masters featured in this book as well as Daniel himself, and membership is at an all-time high as people search for a new perspective. The book tells Daniel's story. In it he outlines the philosophy of Jediism and provides practical tools for anyone interested in gaining a deeper understanding of how to use the Force in everyday life. Sadly, pretty much all modern religions preach hate. If you don't follow their path then you're off to Hell. If you're gay, a non-believer, use a condom, watch or read certain material or eat processed meat... then you can pretty much kiss an enjoyable afterlife goodbye. The message of most religions is intolerance of those different to them... something I would have though a real loving god would frown upon... but apparently not. So, the emergence of a new order, a Jedi order, seems on the surface like a wonderful idea. It's the perfect religion for those that don't believe in religion; for those who wish to be part of something that pushes for acceptance, tolerance - pretty much anything positive which religion turns its back on. Become the Force is collection of ideals and belief systems that attempt to take the idea of being a Jedi from the Star Wars franchise. You'd be forgiven for thinking it was going to be a tongue in cheek look at how to live life like a Jedi... but it actually takes itself seriously... perhaps a little too seriously. There are some interesting concepts and ideals here but those that are thinking of buying as a joke present for a friend may be a little disappointed in the seriousness of the book. It borrows heavily from numerous self help releases and neatly dovetails it into the world of Star Wars. If it weren't for the fact that it's marketted to appeal to Star Wars fans you probably wouldn't even give it a second glance.